Sutherland JM and Hellsten E. Integrated Funding: Connected the Silos for the Healthcare We Need. Toronto, ON: C.D. Howe Institute, 2017. Davis K, Stremikis K, Squires D, Schoen C. Mirror, Mirror on the Wall: How the Performance of the U.S. Health Care System Compares Internationally. New York, NY; 2014. Miller HD. From volume to value: Better ways to pay for health care. Health Aff (Millwood). 2009;28(5):1418–28. Appleby J, Harrison T, Hawkins L, Dixon A. Payment by Results: How can payment systems help to deliver better care? London: The Kings Fund; 2012. Hackbarth G, Reischauer R, Mutti A. Collective Accountability for Medical Care-Toward Bundled Medicare Payments. N Engl J Med: 2008;359(1):3–5. De Bakker DH, Struijs JN, Baan CB, Raams J, de Wildt J-E, Vrijhoef HJM, et al. Early results from adoption of bundled payment for diabetes care in the Netherlands show improvement in care coordination. Health Aff (Millwood). 2012;31(2):426–33. Nyweide DJ, Lee W, Cuerdon TT, Pham HH, Cox M, Rajkumar R, et al. Association of Pioneer Accountable Care Organizations vs Traditional Medicare Fee for Service With Spending, Utilization, and Patient Experience. JAMA: 2015;21244. Provinces pay people and institutions to deliver health care to their residents. How they pay for this care matters: a large and growing body of international research confirms that the choice of payment models used to fund health care providers can have a strong influence on their behaviours (Sutherland, 2011). Despite this evidence, the subject of health care payment systems tends to receive scant Canadian public attention outside of the relatively narrow (and mostly irrelevant) confines of our perpetual national debate around the optimal share of public versus private financing of health care services (Flood & Xavier, 2008). 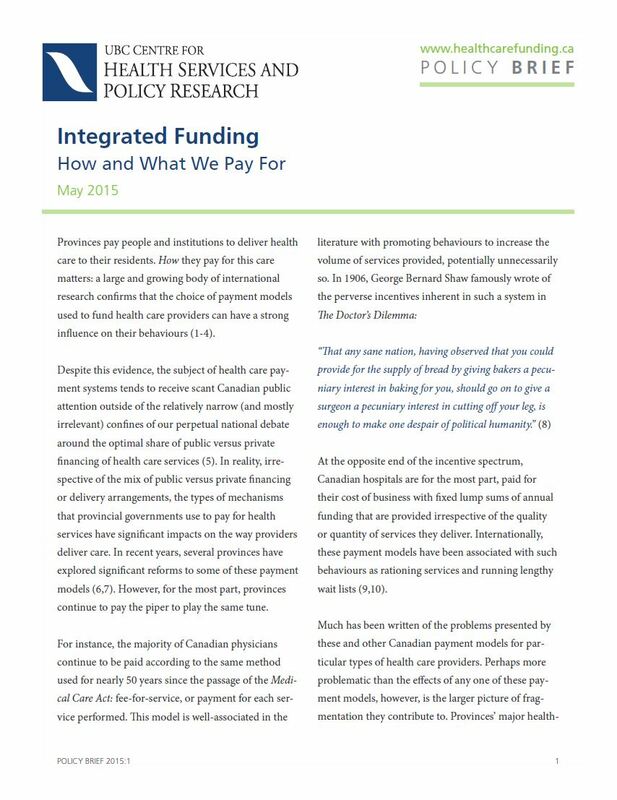 In reality, irrespective of the mix of public versus private financing or delivery arrangements, the types of mechanisms that provincial governments use to pay for health services have significant impacts on the way providers deliver care. In recent years, several provinces have explored significant reforms to some of these payment models (Sutherland et al., 2013; Glazier et al., 2012). However, for the most part, provinces continue to pay the piper to play the same tune. At the opposite end of the incentive spectrum, Canadian hospitals are, for the most part, paid with fixed lump sums of annual funding that are irrespective of the quality or quantity of services they deliver. Internationally, these payment models have been associated with behaviours such as rationing services and lengthy wait lists (Schut & Varkevisser, 2013; Busse et al., 2011). Much has been written of the problems presented by these and other Canadian payment models. Perhaps more problematic than the effects of any one of these payment models, however, is the larger picture of fragmentation to which they contribute. Provinces’ major health care sectors — typically delineated as primary care, acute care, post-acute care, home and community-based care, drugs, mental health and public health services — are all administered in a confusing field of silos, with disconnected financial flows, performance measurement systems, organizational structures and governance arrangements (Weil, 2016; Sutherland and Hellsten, 2017). While many other countries also struggle with similar issues around health system integration (Tsiachristas et al., 2013), Canadian systems appear to be particularly fragmented even by international standards, evidenced by our poor standings in international health system performance: in a recent survey of OECD countries, Canada ranked 10th of 11 in overall health care performance, above only the US, with poor showings in the important sub-categories of safety (10th of 11), coordination of care (8th) and timeliness of access (11th) (Davis et al., 2014). The recent experience with international payment reforms provides some potential lessons for Canadian policy-makers. A number of countries are stepping beyond modifying sector-specific payment models to implement broader payment reforms that attempt to align the incentives of multiple types of providers. For a detailed look at the international experience and options for Canada, please download our policy brief.